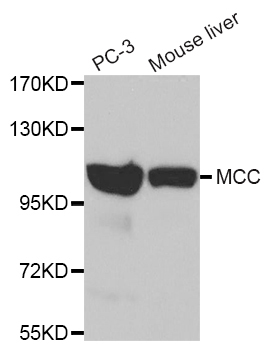 MCC antibody LS-C349218 is an unconjugated rabbit polyclonal antibody to human MCC. Validated for IHC and WB. 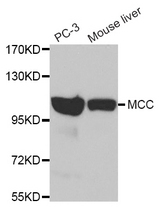 The predicted MW is 93kDa/113kDa, while the observed MW by Western blot was Refer to Figures. 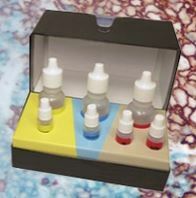 Western blot of extracts of various cell lines, using MCC antibody.